i like digestive biscuits; does that make me a bad person? the daily planet building in metropolis has a globe sited atop its almost square plan exterior. the windows are almost uniform in size, though this is more of an optical illusion, as each successive stage of the building has been proportionally designed. thus those windows near the top are smaller than those giving light to the lower floors. despite being surrounded by similar buildings of predominantly stone facade, reflections from opposing glass have a tendency to concentrate the sun even on colder days, making the interior often uncomfortably warm. windows are mostly left at least half open, and in warmer months, the air conditioning is close to working overtime. i need not inform you that the daily planet is a national newspaper, so activity on each floor of the globe topped building is at best busy, often increasing to frenetic. most of the staff have left jackets and coats on stands near the corner of the open plan offices, and work at their desks in shirt or blouse sleeves. although sheepish and perhaps a bit more cool, calm and collected than the majority of the reporting and editing staff, clark kent is not any less busy than his colleagues, yet he has a hidden secret that he must protect at all costs, a secret that inconveniently always requires a telephone box to unveil. actually, clark has two secrets; one is that well-known by readers of his adventures (he is superman), and the other is that he is more than just uncomfortably hot. look at the situation in an educated and pragmatic fashion. lots of people busily working on the next edition of the daily planet, sun beating incessantly through a myriad of glass windows, erratically operating air-conditioning, and clark kent is wearing a blue lycra outfit, a pair of underpants with a belt and a full-length red cape underneath his suit, shirt and tie. if you think you've got it hard, spare a thought for clark, because he can't even loosen that tie and unbutton his collar. all this in order to be ready at a moment's notice for impending doom, disaster and green kryptonite. 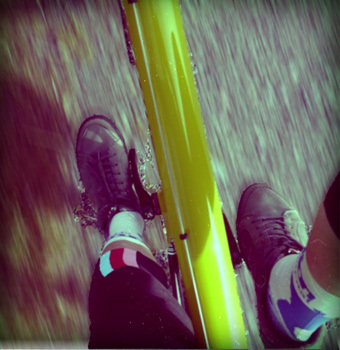 clipless pedals are a great boon to the modern day cyclist. while many have not yet made that leap of confidence and still adhere to toe straps filled by an ageing pair of trainers, an increasing majority of would-be racing cyclists have adopted a duck-like stance and walk, thus preventing any chance of running to the cafe to be first on the sofa. assuming your daily travail includes the possibility of nipping out for a quick sprintfest at lunchtime, or working stoically at your desk while surreptitiously keeping one eye on the clock, ready for a le mans type start the minute that number five is reached, on a polished tiled floor, there is little chance of carrying off a subtle, confident and insouciant scramble for the bike racks at home time. something needs to be done to remedy the situation. of course, a solution has existed for many a long year, a solution that removes the need for bright red triangular cleats on carbon soles, and allows for walking as normally as the next daily planet reporter. as long as that daily planet reporter isn't lois lane. 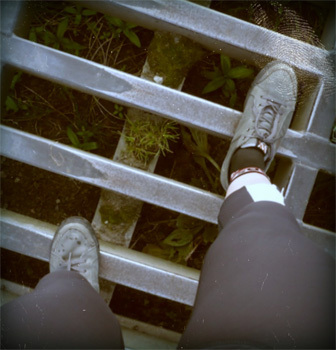 if you've ever trawled through one of those outdoor catalogues, in particular the pages featuring chunky suede styled hiking boots and shoes, you'll have a good idea of where many an offroad shoe received its architectural sculpting from. so while footwear such as that incorporating miniscule cleats allowing scare-free and mark-free walking on shiny tiled floors is just the advance the archetypal office clock-watcher desires, the exterior may find itself either too much of a giveaway, or sartorially inappropriate. but all need not be this way. missionworks is a san francisco based company that makes bags, clothing and now shoes for that class of cyclist fitting the urban description. teaming up with shoe company dzr, whose heritage may encompass a similar raison d'etre, and whose location isn't that far away (palo alto) didn't seem too much of a stretch. 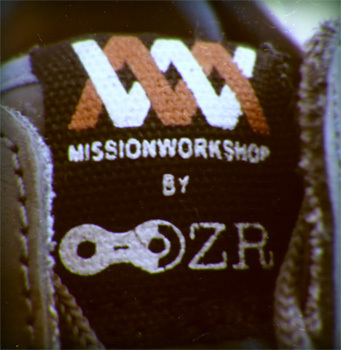 combine missionworkshop's style and swagger with the expertise at dzr, and the rondel shoe makes more sense than that globe on top of the daily planet building. 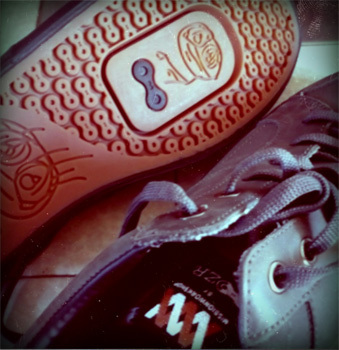 fashioned in grey leather with a flat patterned sole featuring the dzr chainlink logo, the rondel shoes are comfortable and supple with matching grey laces and the rather intriguing intertwined 'm' and 'w' missionworks logo imprinted on the outside of each, as well as on an embroidered patch on the tongue. the sole owns a slot into which an appropriate cleat can be affixed, but should you opt to stick with platform pedals or toe clips, this slot can be left intact. cyclocross is the only seemly undertaking on a bicycle at this time of year, and with a suitable velocipede in residence for a while (ibis hakkalugi) fitted with a particularly apt pair of pedals (crank brothers egg beaters), i took a knife blade in my own hands and cut the delineated section from each sole. believe me, that is almost as scary as chopping those extra inches off a new pair of forks. the tiny (by comparison) cleats nestle just below floor level, allowing a rushing and a hustling on pretty much any floor surface you can describe without disapproving looks and a repair bill from mrs washingmachinepost. 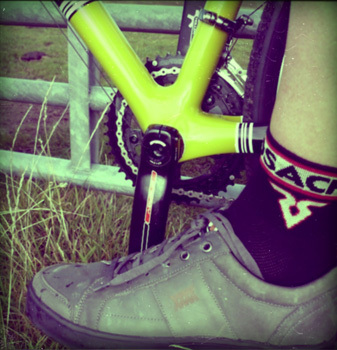 i can see the quizzical looks on a few faces at the back of the class; surely i cannot seriously be considering wearing what are essentially a pair of skateboard shoes for the altogether more infinitely rugged pastime of cyclocross? actually, yes. of course i haven't an earthly of ever being islay's incarnation of sven nys; it is not hard for me to fall off when i stop, and my leaping aboard after carrying across unforeseen obstacles would almost look competent were it not for the fact that my feet flail nowhere near those eggbeaters. in short, i coudn't ride cyclocross if my life depended on it. however, such elaborate incompetence places more strain on any footwear than that demanded by competitors in the super prestige series, if only because both feet and shoes need be wary of allowing me to injure myself and provide a source of hilarity for unsuspecting passers-by. let's not beat about the bush here; these rondel shoes were never designed for cross riding. the word 'urban' does not stretch its definition that far. and an all but flat sole bearing no resemblance to those from the outdoor catalogue shouldn't, by definition, grip wet grass, wet leaves or the more usual mud, and it would be grossly unfair of me to expect otherwise. but you know what? surprisingly they proved themselves more than equal to the task, and i can honestly say that i have never once fallen by the wayside due to a lack of grip from the sole. if i need to quibble and moan (which i do), my quibbles and moans would almost solely be aimed at the laces. apart from the fact that they are about twice as long as they need to be, they're also a bit too elasticky. on at least two rides so far, despite double knots and tucking the excess inside the shoes, one lace has all but been cut in half by the chainring as it came loose and flapped in the wind. the elastic tendency makes it hard to tighten those laces to a suitable degree. the degree of stiffness of the sole is fairly adequate, but would likely be better aided by my using crank brothers candy pedals rather than the more spartan eggbeaters, since the former have a supporting platform around the cleat engagement. disengaging the feet in a hurry, while chiefly the preserve of the pedals also impacts on the shoes due to the repeated twisting motion, and while it would be hard to compete with the carbon soles of my more regular road shoes, i was quite impressed at how positive the unclipping was on each occasion and how relatively little flex was incurred in the process. thus when that office clock strikes five, it's a piece of cake to grab the missionworks bag from behind the desk and run for that bicycle in the daily planet lobby. unless you've left it in the phone box. and just in case you're wondering, the headline has nothing to do with the article; seemed like a good idea at the time.